The Sunday night 2-meter net starts at 9 PM ET on the DART repeater, 146.640 (100 Hz PL). This net is used to catch members up with club news and information and just to keep in touch. The net continues throughout the summer. If you would like to be a net control operator, please contact the net manager Bob N8REL. Control ops download the Sunday night 2m Net Control Script. 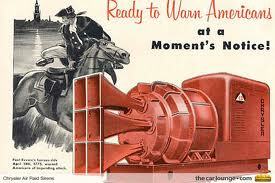 In 1952, the city of Detroit purchased 20 Chrysler-built air raid sirens at a cost of $5,500 each (approximately $43,966.48 in 2009 dollars). The HPARC club operates the Oakland County ARPSC monthly Siren Test subnet. The sirens sound at 1 PM on the first Saturday of the month beginning in March and ending in November. The participants usually get on the air about 12:30 PM as they head toward their sirens. We use the DART repeater on 146.640 MHz (100Hz PL). The net manager is Marsha Fleming N8FE. If you want to participate in the siren test, please contact Marsha at n8fe@arrl.net to be pre-assigned a siren. Also if you are near a siren when it sounds, feel free check in to the net when she calls for additional check-ins. NOTE: There is NO siren test on the first Saturday in April; instead a special siren test will held on the Wednesday in conjunction with Severe Weather Awareness Week.